On June 20 I joined three good friends and headed to Europe on what Globas Gateway called "A Tour Of The Alpine Countries." The first adventure was a holding pattern for an hour then rebooking on Lufthansa because our Delta flight could not land on time in Atlanta. Adverse weather elsewhere that had caused the delay. I awoke the next morning to a breathtaking view of the emerald waters around the British Isles. 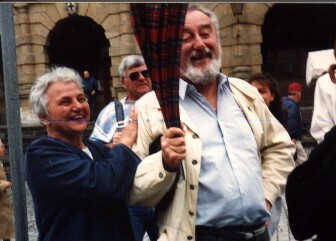 We met tour guide, Ted Rosencrans, after dinner that day. We boarded a bus to tour Germany, Austria and Switzerland. The buffet breakfasts were a real treat consisting of assorted rolls, breads, cheeses, sliced luncheon meats, yogurt, hard boiled eggs, cereal, juice and coffee or tea. The highways had no speed limit but our bus driver, Willie, drove safely. 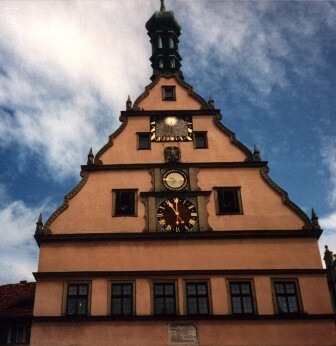 We stopped in Rothenburg to see a town clock where figures of a notorious drinker and the ruling lord were installed to appear at 1100 each day. The buildings are adorned with wooden strips and ornate hinges and door handles. Buildings are stone, trees no longer available for lumber. Long ago people in Europe built for permanency, no edifice falling apart before the mortgage was paid. Our entire trip was bathed in sunshine, through every garden, castle and museum. We walked the side streets of small cities and I climbed every wall. In centuries past, communities built walls around their homes for protection against marauders to expand now beyond them. But what does one do with tons of rock? Keep it in repair for the tourists. Pretty neat, I thought. Gave me a great view over the village, too. Streets were very narrow, not suitable in those old towns for any car bigger than a Volkswagen Beetle. The streets were cobbled with stone, sometimes in very intricate patterns. I watched workmen in one intersection mapping out a circular design with six inch square blocks. If I had the time I would do that on my patio. But we couldn't dally to see the end results. We had several thousand kilometers to go and more exotic sights to see. 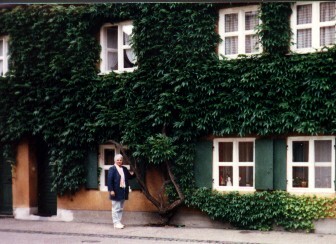 In Augsburg we were shown sixty-six houses built as what I would call row houses. They were established in 1519 and Germany claimed them to be the oldest houses ever built for the poor. There is no doubt in my mind that the Virginia Creeper covering one side of some of the houses had been planted centuries ago. It was a lovely plant with a base trunk about eight inches in diameter. Lindenhof castle was a sight to behold. And we stood in the rain before getting inside. 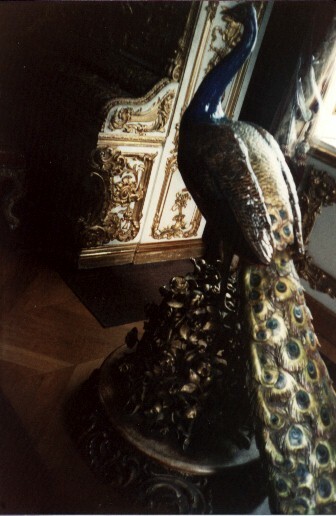 Two oversized ceramic peacocks were displayed outside when Ludwig II was in residence. He had a special piano room for Mozart, whom he supported beyond all others. Some said he became mentally unstable as he grew older when he refused to see his servants. 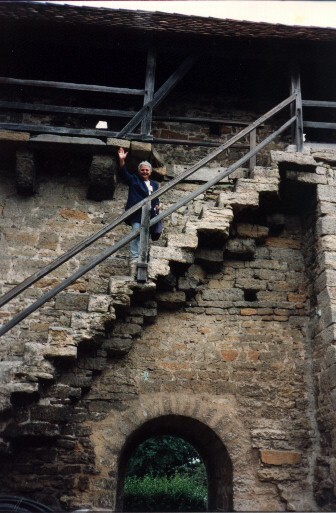 He devised a unique table that could be lowered into the kitchen below for his food, then raised so he could eat without seeing his servants. I don't think his mind was unstable. He was troubled because he was so ashamed for being so extravagant in the furnishings of the castle that he could not bear to have poor people look at him. The riches used to buy the furnishings had to be an outrageous sum even in those days when labor and material was practically worthless. 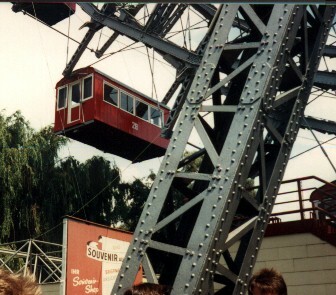 We had several days in Vienna, time to ride the largest ferris wheel in the world. We weren't belted in simple two passenger seats, we stood around with a dozen others in a small building. What a view we had of the city. On the sidewalk below an artist treated us to a lovely pastel drawing from which he probably made his living, and not a lavish one at that. We had time to walk in the city, too, although I did not get to spend much time on the Ringstrasse where artists, musicians and intellectuals met daily for coffee and conversation. A circuitous route took us through tunnels and over mountain roads into the Dolomites of Italy before we arrived in Switzerland which I always thought of as the center of the Alps. I suppose pictures of the Matterhorn put that idea in my head but I was looking forward to seeing that mountain which wasn't much higher than "my own" Mount St. Helens before it blew its top. Several of us took the cog train as high as it went. 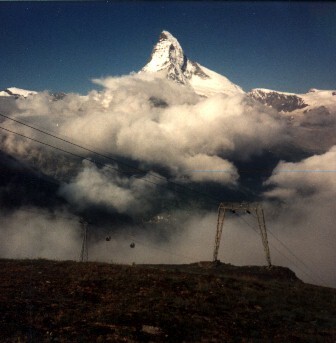 Then we got aboard a ski lift amid the fog, not quite certain we would see the mountain at all. At the top of the lift we glimpsed the peak and the fog burned away for a glorious view as we walked down the mountain trail to the village. We were treated to stops at many fine shops to view and purchase memorable articles from local crafts. The Black Forest suffered from an attack of a fungus and it was doubtful that the lovely old trees would survive. 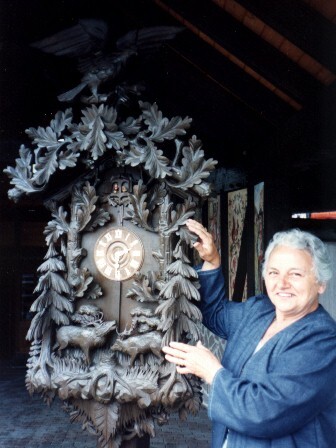 The cuckoo clocks were fabulous works of art, lavish in the carvings and ingenious in mechanics. The Alpine trip was too short to be completely satisfying and just long enough to tantalize me into planning other trips to see more. Moving from one hotel to another almost every day, especially at six o'clock in the morning, made it easier to relax and rest as the kilometers sped beneath the bus wheels over highways our guide insisted inspired the development of the present U.S. interstate system. If so, I applaud.